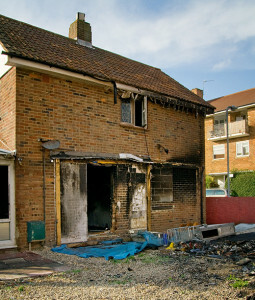 Have a professional restoration service on site immediately after the fire is put out – time is of the essence. Have a professional restoration service that you trust and has the experience to make “key decisions” for recovering damaged property. King’s Quality Restoration is on site as soon as possible after your initial contact to recover your property from fire and water, protect it from further damage AND rebuild your home or office structures to pre-existing conditions. Our technicians have advanced training and certifications, seasoned decision-making skills and tactical procedures to best approach your critical situation. Locally owned and operated we focus all of our expertise on the Louisville and Southern Indiana region. In the event of a fire or water emergency, we recommend that you take precautions to ensure your safety and the mitigation of property damage. 1. What kind of fire was it (e.g., electrical, wildfire, grease)? 2. What type of facility (e.g., daycare, warehouse)? 3. How was it suppressed (e.g., water, foam, Halon)? 4. What contents were in the burning building (e.g., pesticides, newspaper)? 5. How quickly do you need the facility open (e.g., for retail, operations, living)? Once the initial clean up has been addressed, our technicians will secure your property by boarding up windows, securing doors, erecting a fence, and covering firefighting holes in the structure. These precautions will protect your property from looters and unfavorable weather conditions that can cause additional damage. As your fire damage restoration contractor, our technicians will take plenty of photographs and help you inventory items that have been destroyed and damaged. Then we will pack-out the damaged items to be cleaned or repaired. In most fires, firefighters use at least some water to quench the flames. Wet building materials will grow mold in the right conditions within 24-48 hours. In order to avoid this additional damage, it is imperative that wet structural materials be dried out as quickly as possible. The Kings Quality Recovery team will employ high-performance fans and dehumidifiers to dry the building materials very rapidly, thereby reducing the chances for secondary damage and mold to develop. Chemicals from smoke residues can permanently stain or change surface finishes in your home. As a qualified fire-restoration contractor, we are experienced in smoke residue and soot clean up and will save as many of your personal items as possible. Another consideration after a fire is odor. Odors can extend beyond the footprint of the fire. We will address and eliminate any odor that has permeated your home through various methods including: cleaning, paint sealing, and treatment with hydroxyl radicals or ozone. Once the smoke damage has been addressed, we will rebuild your home to its pre-existing condition. Repairs may range from a small electrical repair to rebuilding the house from the ground up. As a licensed General Contractor we aim to rebuild your property and bring you home as quickly as possible.